Many hotel owners and managers are laser focused on creating personalized customer experiences and delivering frictionless services via high-tech devices. While they seek to improve automation, and integrate systems on the cloud, on-premises, and IoT devices, most often IT departments are faced with backlogs and skill shortages that impede innovation. The future of smart hotels is quickly encroaching, but with their current app development process, many hotel owners simply can’t keep up. TIBCO Cloud™ Live Apps offers a solution to this problem. It empowers business developers to design apps on their own and easily connect core systems and edge devices to unify existing applications. The result is not only seamless customer service, but also an ability to adapt to ever-changing customer preferences. This enables you to cut operational costs while improving customer experiences. With no barrier to entry, low cost, and little to no coding required, this solution opens the door for you to compete with other industry giants. 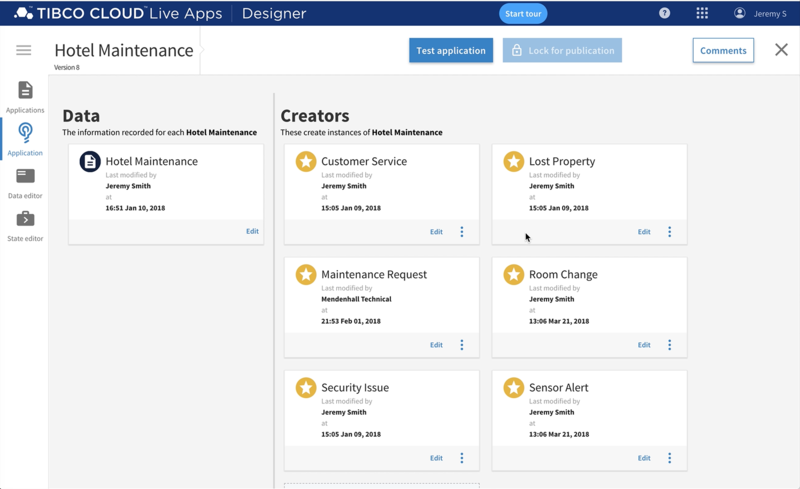 Watch as Live Apps is used to create an application for front and back-office hotel staff to answer customer service requests from an entire hotel quickly and seamlessly. Today, many hotels are aiming to decrease the amount of work required of the customer service staff and increase their productivity via mobile devices. Their aim is to lower operational costs, and, if done correctly, also improve customer experience. Live Apps makes this possible by allowing business users to quickly and easily turn their ideas into fully functional apps while integrating with current systems and unifying customer data. These apps empower employees to collaborate and quickly resolve customer service requests based on the right insights delivered in real time.